1.^ Accordin taethe Basque Statute o Autonomy an aw Euskal Herria. 2.^ Accordin tae the Basque Statute o Autonomy an aw Euskal Herriko Autonomia Erkidegoa. 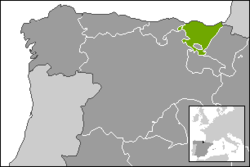 The Basque Kintra (Basque: Euskadi; Spaingie: País Vasco, IPA: [paˈis ˈβasko]) is an Autonomous Commonty o northren Spain. The Basque Kintra wis grantit the status o historical region athin Spain wi the Spaingie Constitution o 1978. The caipital is Vitoria-Gasteiz (Vitoria is the name in Spaingie, Gasteiz in Basque) an Bilbao its lairgest ceety. The autonomous commonty o the Basque Kintra should no be ramfeeselt wi the lairger Basque Kintra (Basque: "Euskal Herria") o which it is a component pairt.